Bake a sheet cake the size that you need. Ice the cake in white icing using a cake spatula making sure that the surface is smooth. Using pink food color spray (also known as color mist), spray the top and sides of the cake lightly. Now sprinkle pink edible glitter on the top of the cake. Next sprinkle white edible gilitter on the top. Mark off a 1 ½ inch (for a half sheet cake) or 2 ½ inch (for a full sheet cake) area along the top edge of the cake. With round tip, size #5, and white icing, do the lace work on the outside border of the cake top edge that you just marked off and on the sides of the cake. With round tip, size #5, write the birthday message on the cake top. 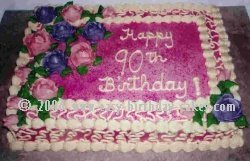 Use large rose tip, size #125 and make the pink and purple roses and place them on the cake top. Make the green leaves using leaf tip, size #352.